The following is our review of Nature’s Bounty Biotin. Biotin is a water-soluble vitamin that can be found in oatmeal, vegetables, and soy. It is part of the B-Family of vitamins. It helps support a healthy nervous system and aids in the conversion of food into energy. It also should help support healthy nails, skin, and hair. Continue reading for our full review. 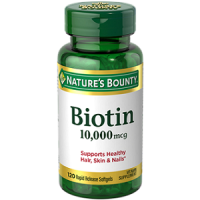 What’s in Nature’s Bounty Biotin? There is 10,000 mcg of Biotin in this product. Biotin is meant to strengthen nails, hair, and skin. Other ingredients include soybean oil, gelatin, vegetable glycerin, yellow beeswax, and titanium dioxide color. It contains no artificial flavors, sweeteners, preservatives, sugar, starch, milk, lactose, gluten, wheat, yeast, fish, and sodium. Results may differ for everyone and it may take longer for one to see results compared to their friend. 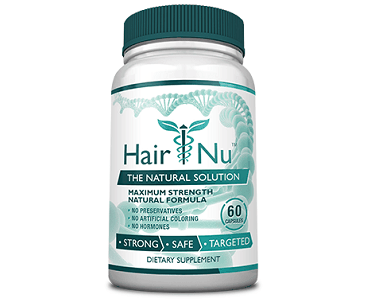 How Do You Use Nature’s Bounty Biotin? It is recommended for adults to take 1 softgel daily, preferably with a meal. You should consult a doctor if you are pregnant, nursing, taking any medications or have any medical condition. If you have any adverse reactions, discontinue using the product. You should keep this product out of the reach of children and store it at room temperature. It is not known how long it will take you to see results since every person is different. 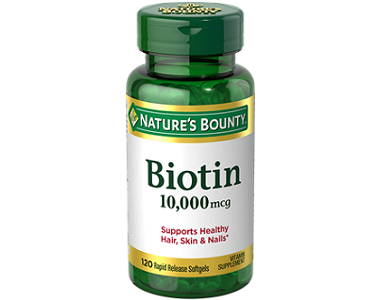 Nature’s Bounty Biotin can’t be purchased directly from the manufacturer. It is sold on Amazon for $10.32 for a bottle of 150 softgels, which will last you 5 months. You can also buy a bottle of 60 softgels that will last you 2 months for $6.41. As you can see this product is extremely affordable. This product is not backed by a manufacturer’s guarantee since it can’t be purchased directly from them. This shows they don’t have much confidence in their product’s effectiveness. It also doesn’t allow the customer to have much confidence or a risk-free buying experience. You will need to check the return policy of the retailer you use. This product has many positive customer reviews that said this product helped increase hair growth and decrease hair loss. Some customers also reported getting sick while using this product. There are a couple of positive things about Nature’s Bounty Biotin. It is extremely affordable since 1 bottle will last you about 5 months or 2 months depending which size bottle you decide to purchase. It also has many positive customer reviews. Customers believe that this product has helped their hair grow and even helped their hair from falling out. There were a couple of negatives as well. This product doesn’t come with a manufacturer’s guarantee, which shows they don’t have much confidence in their product’s effectiveness. It also doesn’t allow the customer to have a risk-free buying experience. Some customers also reported getting sick from these softgels. One customer even said that the softgels messed with their hormones. We have a good feeling that you can find a more effective product elsewhere.